Roger Ebert: There's not a wasted shot in Wilder's film, which is single-mindedly economical. Students of Arthur Schmidt's editing could learn from the way every shot does its duty. There's not even a gratuitous reaction shot. The black-and-white cinematography by Charles Lang is the inevitable choice; this story would curdle color. And notice how no time is wasted with needless exposition. A wire-service ticker turns up there, again without comment. A press tent goes up and speaks for itself. Columbia Journalism Review: As journalists we’re both truth-tellers and storytellers, and there’s an inherent tension between those two roles. Sometimes the truth is just flat-out boring. There just might be a great story to be had out of some rattlesnake hunt somewhere at some point in time. But the one you’re assigned to cover on any given day isn’t likely to be it. Ace in the Hole is about when the story becomes more important than the truth. Deep Focus Review: As with so much modern media, Tatum decides what his readers know and where the story goes. His reports on and develops his yarn in the manner to which he desires. Television and newspaper journalists choose what they report; this is a subjective process, as opposed the ideal objectivity professional journalists have forever yearned for but rarely achieve. Tatum simply takes subjectivity to the next level: interaction. 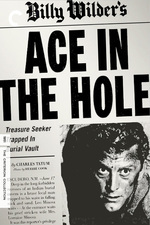 While Ace in the Hole may seem satirical with Tatum pulling the locals’ strings like a puppeteer, reconsider the film’s basis in fact, that such events actually occurred to an extent. In some instances, they still occur today. Most recently in 1998, Steven Glass was fired from The New Republic magazine for fabricating entire stories. Names, places, events—all made-up. This is, of course, the next extension beyond what Tatum does in the film. And luckily, no one died from Glass’ actions; moreover, since there is no law against bad journalism, Glass was never punished. "We've got an ace in the hole." Must-see viewing for any fans of Nightcrawler [previously on FF]. God this movie is DARK, and not just dark for the time. It's as brilliant as Sunset Boulevard but without anything to relive the pitch black cynicism and tension. Seriously - you're just longing for a monkey funeral the whole time. It's great. Perhaps the most cynical movie I have ever seen, just dripping with contempt. When the actual carnival sets up, you know that this was made my a man with a loathing for humanity, and it seems well-earned. Can someone enlighten me on what this is? Google is only showing me a lot of dead monkeys and racism. I thought the film was a fine example of noir, but not as cynical as I was hoping based on the reviews here. Leo Minosa has a heart of gold, Chuck Tatum (eventually) finds a moral center, and the newspaper man with "TELL THE TRUTH" embroidery hung to every wall turns out to be sincere. At the start of Sunset Boulevard, when Gillis first meets Norma, she's having a funeral for her pet chimp.